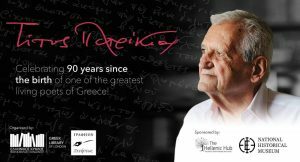 A very moving tribute to Titos Patrikios, one of the greatest living Greek poets, was organized by the Greek library of London, the Hellenic Hub and the Poetry Office at the Hellenic Centre in London on the occasion of his 90th birthday. A full house of well above two hundred people, Greek and British, enjoyed a great evening forworded by the emeritus Korais professor Roderick Beaton and his former colleague Professor David Ricks, both distinguished Hellenists from King’s College London. A very rare audiovisual show of Patrikios’ early years was also projected. 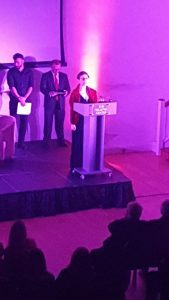 There were of course readings of Patrikios’ poems from different periods of all his long prolific lifetime, beautifully enacted by former ambassador of Great Britain in Greece Jonn Kittmer, our own Dr Dimitra Tzanidaki-Kreps, Modern Greek fellow and actress, and Greek actor author Konstantinos Alsinos. All the readings were interspersed with beautiful original piano compositions by the Italian pianist Anthimo. 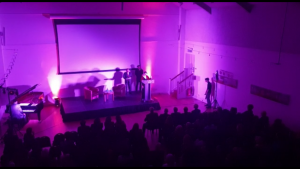 Finally, the Poetry Office’s head and author, Mr Skiathas, conducted a lively interview of the poet himself followed by an extremely stimulating live audience interaction with the poet. Readers may be interested in the latest CUCD Bulletin, which contains a jointly prepared piece to which our own Barbara Goff contributed: you can find the piece here. The article considers the continued appropriation, and misappropriation, of Classical themes in political discourse, which is one of Barbara’s research specialisms.